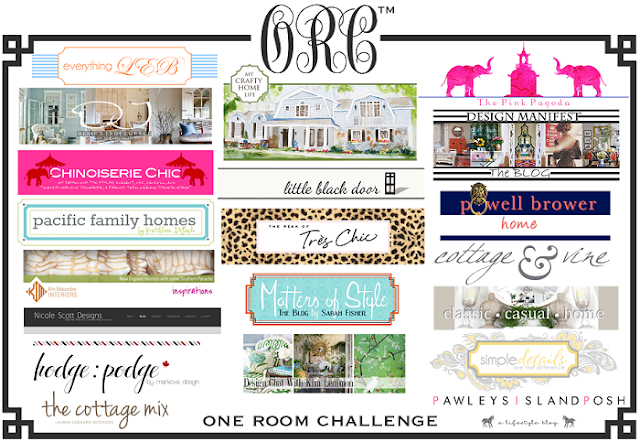 OK, I have to say...I am kind of sad the One Room Challenge is over:-( Linda from the wonderful Calling it Home blog, has made me feel like part of the One Room Challenge Family. To catch everyone up, Linda has gotten together 20 bloggers (some are designers, others DIY'ers and some interior design bloggers) for a 6 week challenge to re-do transform a room. Not only have I- and the 19 others- transformed some not-so-beautiful spaces, but we have all gotten to know each other a little bit better, week by week. Every Wednesday I wake up excited to click on all of the links and see how the others are doing. I regaled in the stories of the good and the bad that comes with a transformation. Today, I can't wait to see if everyone finished!! I call this whimsical, teenage, fun with a sophisticated twist. I wish my bed was as beautiful as this. The lovely shape, the fuchsia linen, the permanent skirt, the hidden trundle- ahh. 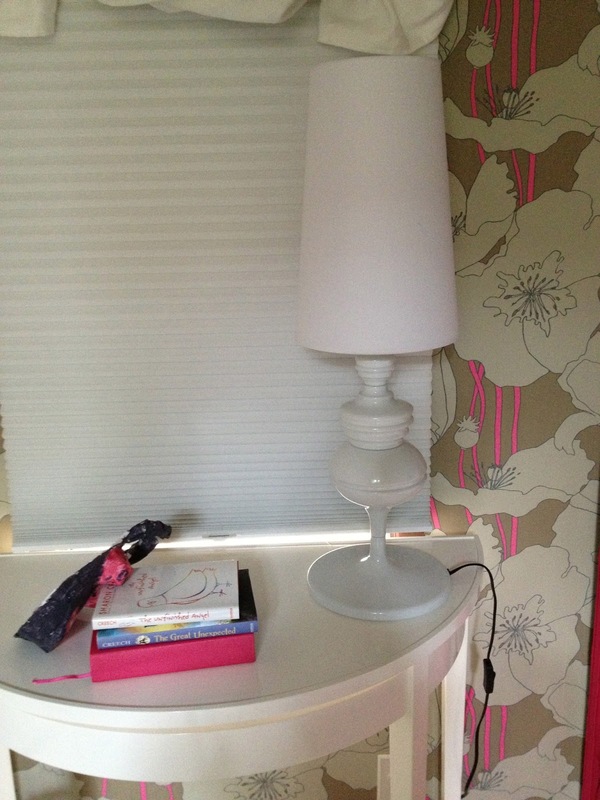 I also adore the Osborne and Little wallpaper with the sophisticated flowers and hot pink stems. I may break in and steal the Oomph demi lune side tables. I am so glad I chose the white table so it complemented the room, not draw unnecessary attention. The little bit of fuzz in the area rug and the long Flokati pillow give the room some extra fun. I have been told that it is very "awesome" to wake up and wiggle your toes in the Flokati rug. I think my toes would like to wiggle in that instead of landing on my hardwood floors:-) Almost forgot, I love my client's framed art. She is very talented. The little ghost chair has made a second area to sit which is perfect for "the little sister!" I hear that the little sister creeps into the room and sits at the table to draw while the "client" is doing her homework. My client's favorite thing is the acrylic egg chair. I think I know why. Every time I see it, I want to say, "Weeeeeeee!" Have you ever seen the little piggy on the commercial that does that? I laugh every time! Personally, I heart Kerry Steele's art. 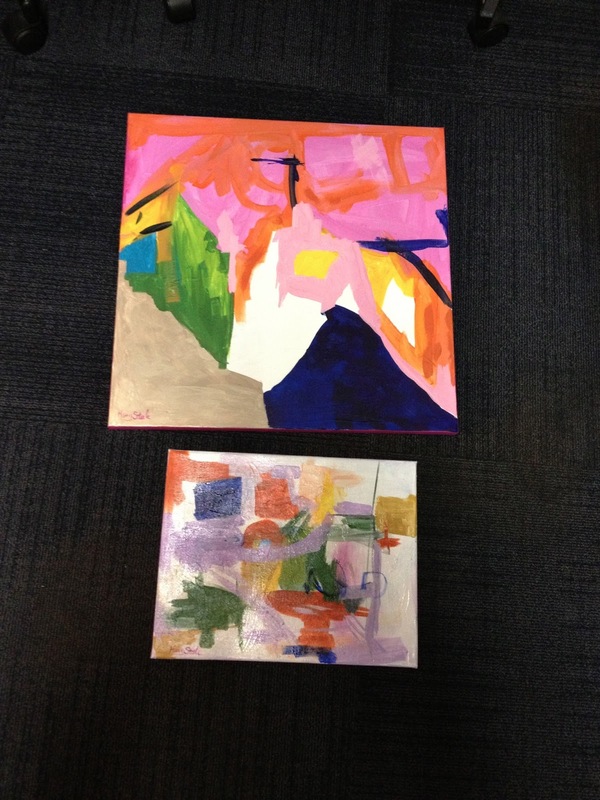 I don't know if she has any left for sale because so many One Room Challenge rooms feature her art!!! Tons of room for HER stuff!! Thank you all for being a part of my journey!! I had so much fun and I hope I get asked to do it again- hint, hint!!! Please go visit my friends on their blogs below. Again, special thanks to Linda from Calling It Home as well as Jennifer from My Pink Pagoda! Jennifer designed this banner below. She is a talented artist!! I will see you very soon!! It is so freakin' cute. 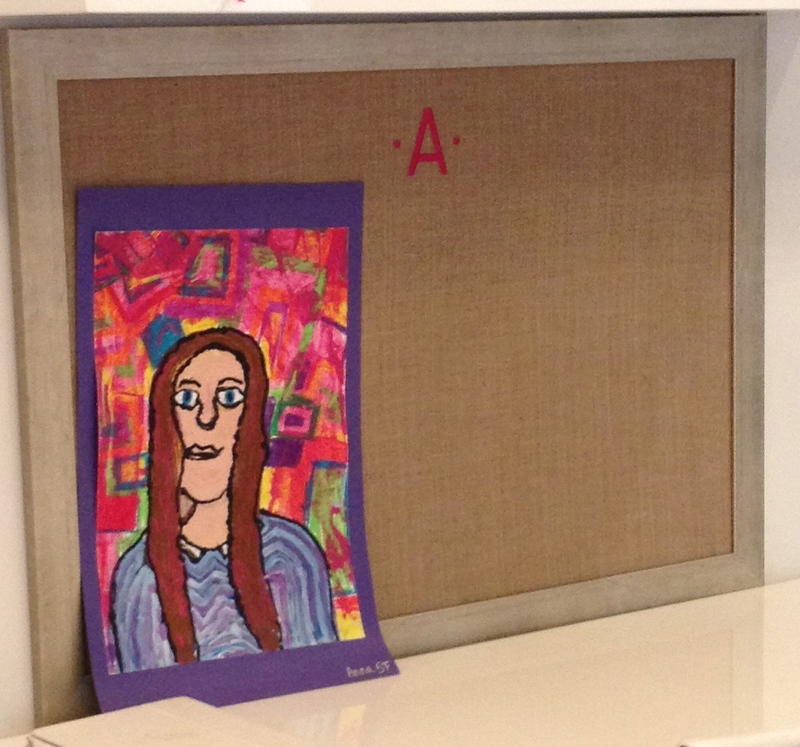 I love every element that you chose and I am very flattered that my art is a part of the room. So fab!! I am in love with the wallpaper!! And the bed!! Great work! Such a fantastic room! That wallpaper and all the details are incredible! What a fantastic room Kathleen! I know your clients are thrilled. I love all the elements but especially that feature bed wall; the paper the bed, gorgeous! It looks very inviting and the perfect grown up hangout for a teen girl. Love it! Im sad to see the challenge end, too- keep in touch! Kathleen, this is so fun. I wish I had a space like this, and a swing when I was that age. Actually, I would love one now, but I would have to share it with my kids. I really like how you combined the large scale wallpaper with the art and pillows. FUN! A perfect spot for a teenage girl!! It looks beautiful Kathleen! 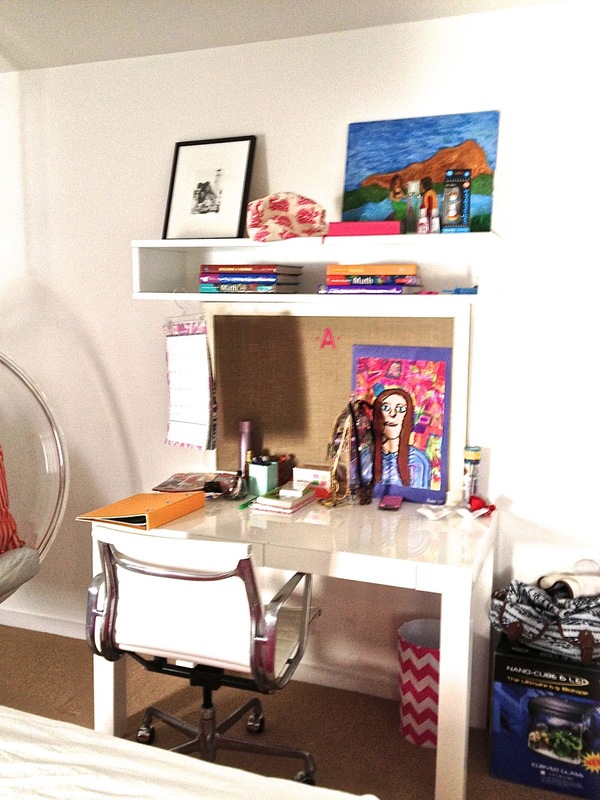 I have teens and truly appreciate how you pulled together a space that is a bit more mature but still fun. This room will take this girl through college! The beautiful bed and hanging chair and overall feel remind me of a Jonathan Adler hotel we stayed at in Palm Springs. Fabulous job! 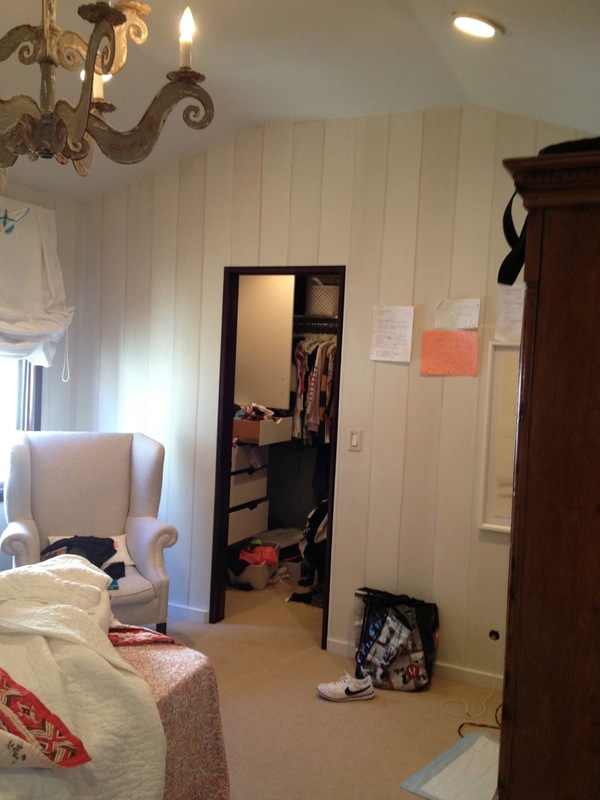 SO much to love, Kathleen ~ can't imagine how thrilled your client is to have this one-of-a-kind room! You've filled it with amazing statement pieces from top to bottom! Wonderful job! Awesome jon Kathleen. You nailed it!! She must be so happy. I love that rug too!. All the best! I want to break in and take everything here, what a beautiful room for a girl at any age!! I would have loved to have a space like this when I was little. Such a lucky girl to have a one of a kind bedroom like this. What a fantastic job you did!! 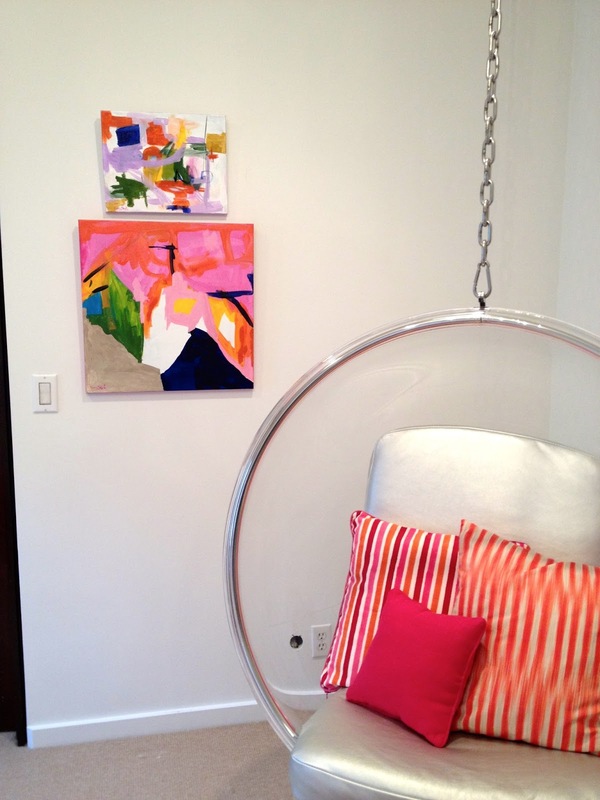 How fun is this - just love the hanging swing and yes, we too bought a Kerry Steele piece of art for our beach house remodel that we love. The wallpaper just adds the perfect touch to bring it all together...just wonderful!! I love what you have done here from the bed to the wallpaper to the ghost chair to the egg chair to the Kerry Steele art. Such a wonderful mix of girly, chic and fun. Well done! 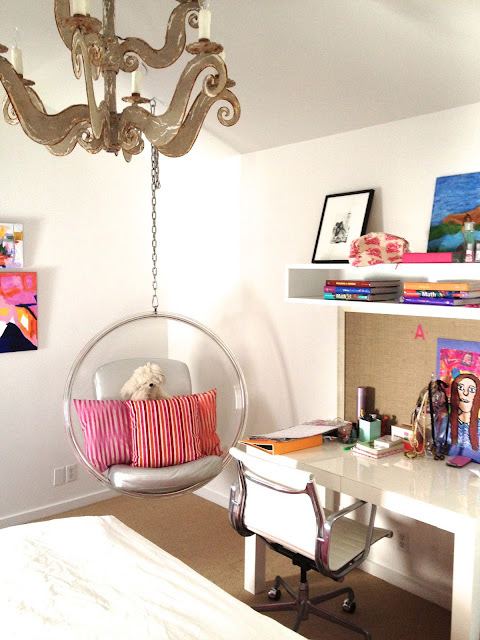 I wish I had a room like this growing up, this is fabulously chic! 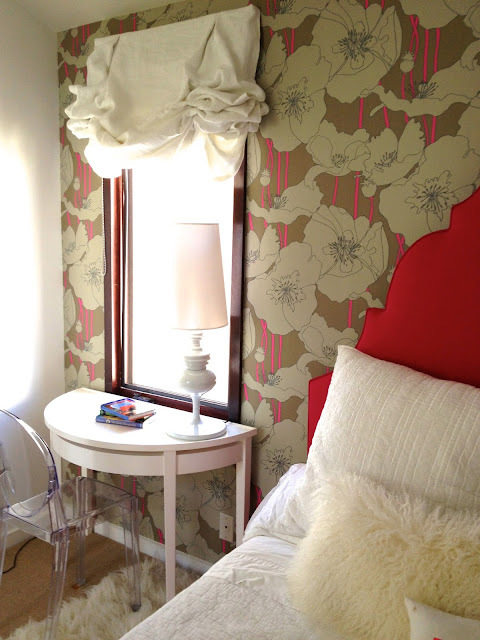 I adore the bed and wallpaper, you did a super awesome job! Love it! I really love this!! Everything works beautifully together. 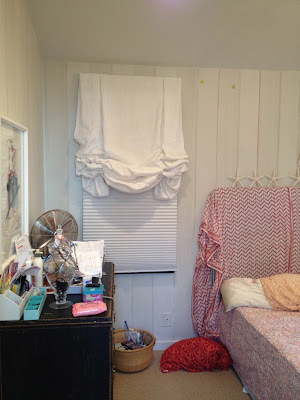 My favorite part is probably those beautiful window treatments! Oh and of course the feature wall. That bed is to die-for...with a trundle! This must be the most popular sleepover place now. 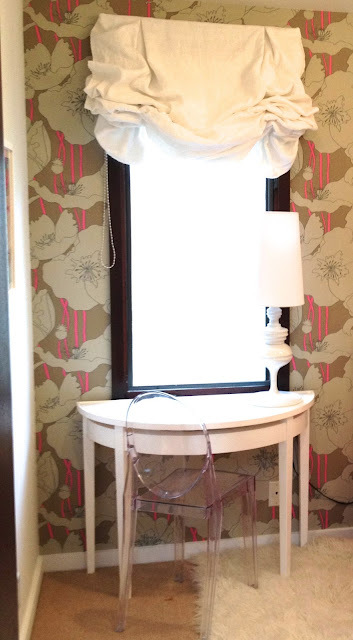 She will have so many great memories in this beautiful, fun room that you created for her. Bravo! Fantastic!! 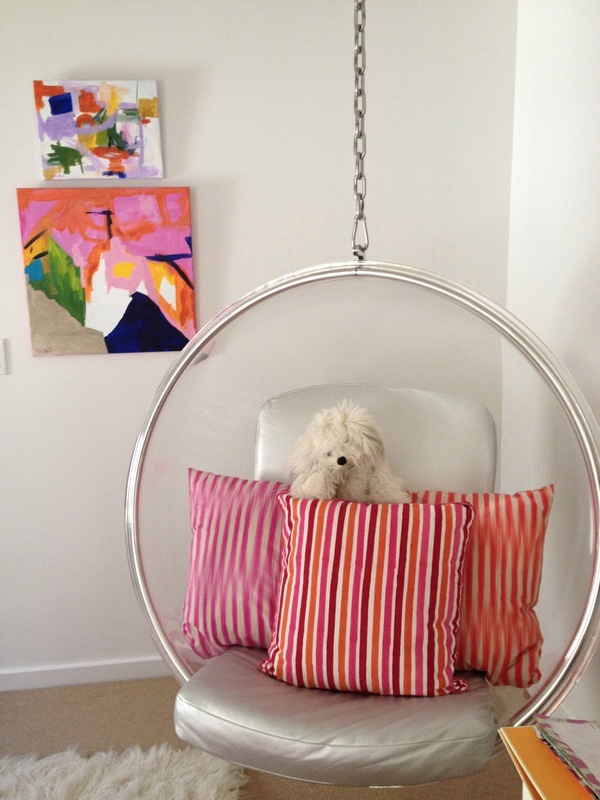 I love all the different fun elements: the bed, the egg chair, the flokati. :) Great job! Amazing transformation~ I love all the details - they make the space! 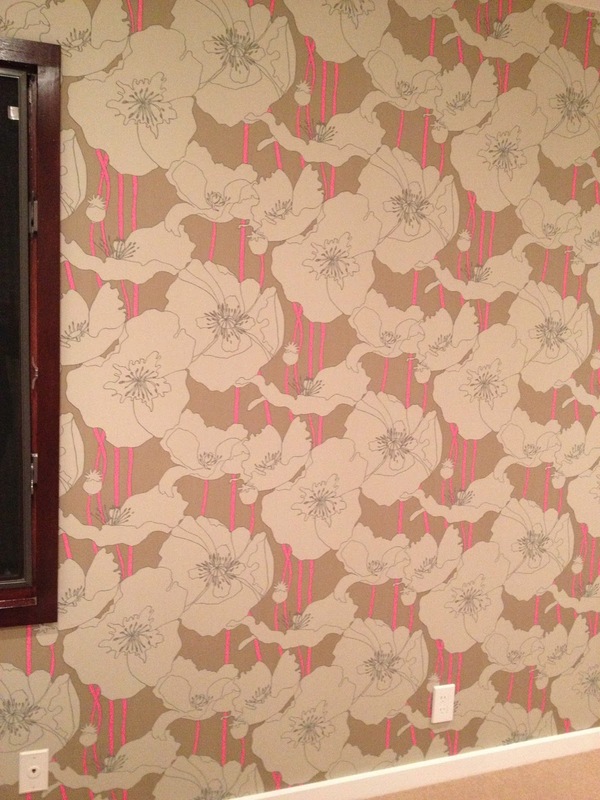 And that wallpaper - gah - love! Such a dramatic room! I love how the headboard pops against that wallpaper! FUN but sophisticated. That wallpaper is to die for! Still dying over that bed in that fabric against that wallpaper..... and so on. Have I told you before that I could be completely at home in this bedroom? Lovely! Damn gurl!! Love it all. I will not list everything I love about this room -- it would get way too long!! Kathleen you are sooooo talented! This little girl must be so excited and proud of her bedroom! Actually I'd be thrilled if it were mine! I'm so glad you joined ORC! Wow this room is soo fun!!! I love it all! What a pretty room. 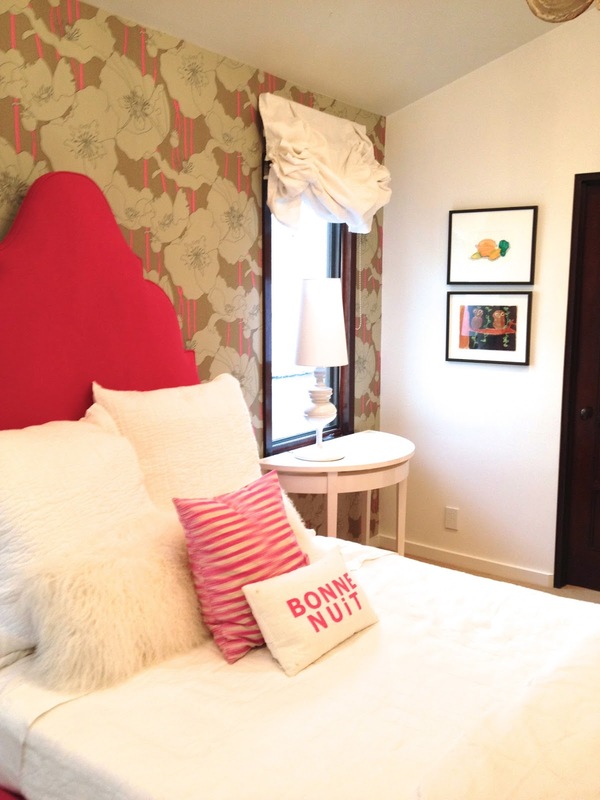 Love the pops of bright pink in the headboard, the bonne nuit pillow, and the wallpaper. I love the wallpaper, chandie, and swing! 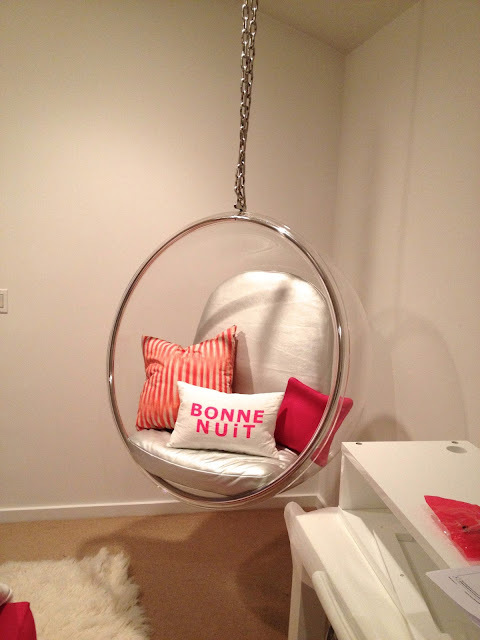 I've really thought about incorporating a swing in one of the rooms in my home, so nice to see someone that has done it!